The ability to uniquely design and build a block retaining wall that creatively blends as a functional element in your landscape and solidly stand year after year is something that only an experienced craftsman can deliver. At Schneider's, our experienced, certified wall builders and designers possess that craftsmanship and can construct just about any block retaining wall you can dream up. 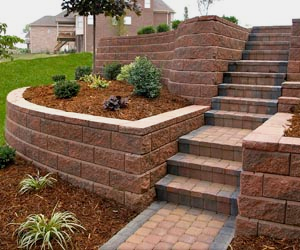 Retaining walls add an aesthetic yet functional element to your landscape. Most commonly used to hold back or retain a hillside, providing some degree of levelness, retaining walls will give depth and a contrasting interest to your landscape. Schneider's approach to every retaining wall project is simple; define the functionality of the retaining wall and incorporate this functionality into a unique design that not only compliments, but accentuates the architecture of your home and landscape. 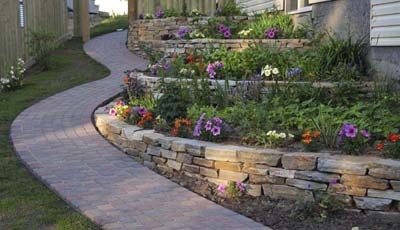 Our retaining wall installers are experienced at landscape wall and retaining wall construction. They possess the knowledge and skills necessary to keep retaining walls from sagging and leaning forward, providing a professional installation. 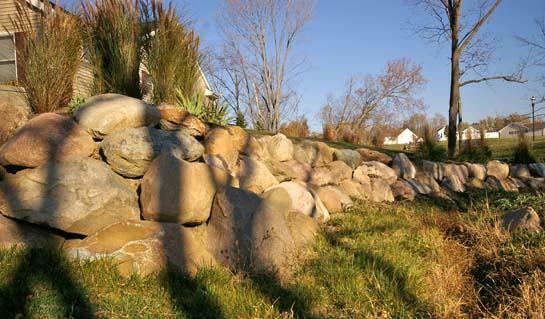 We offer several choices for retaining wall material; block, rounded boulders, flat outcropping or stacked stone. Designed to appeal to nature, our stone walls are built with the same uniqueness and integrity as our block retaining walls. Whether you live in a wooded setting or in an open area one of our stone wall options will provide your landscape with the natural charm it deserves. 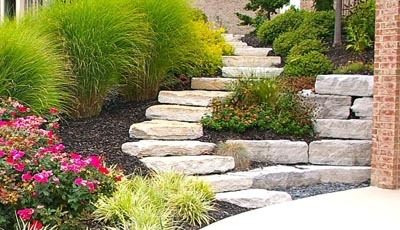 All Images and Content Copyright Schneider's Lawncare and Landscaping | Retaining Walls, Cincinnati. All rights reserved. Block Retaining Wall ~ Liberty Twp. Boulder and Stone Walls, A Natural Function!